Related Information * The housing is compatible with the Ricoh GR Digital lll camera. However, if using the GR Digital III the user must switch off the AF fill light control to ensure compatibility. 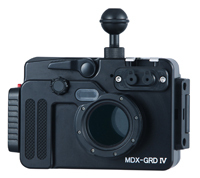 Ergonomically designed MDX-GRD IV is a precision machined underwater housing made from a solid block of aluminum alloy. By inserting the Fiber-Optic Cable into the housing connector, an external strobe will be optically connected to the camera’s built-in flash enabling full-featured strobe photography and creative lighting expression. 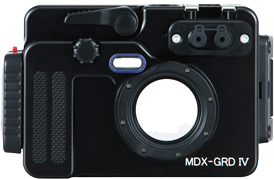 The Wide-Angle Conversion Lens for DX-1G (optional) can be mounted on the port of the housing. * When the lens is mounted, the angle of view increases from 28mm to about 18mm (35mm film camera equivalent). * Shadow of the lens will appear in images if the camera’s built-in flash is used when the lens is mounted. Use of an external strobe is recommended. With the Screw mount for SA8 M10 Fixed Ball Base, various lighting options are possible. The LCD Monitor Hood with Lens (optional) can be mounted. The monitor hood covers the entire LCD preventing unnecessary reflections and glare while helping to provide clear images from corner to corner. The housing can be easily opened and locked with the rotary latches and hinges. The Sea Arm 8 or the Sea Arm 7 can be mounted utilizing screw mounts on the bottom of the housing, external strobes can be fixed.